YB Dato’ Sri Mustapa Mohamed, Minister of International Trade and Industry and YB Dato’ Chua Tee Yong, Deputy Minister of International Trade and Industry participated in the World Economic Forum on ASEAN 2017 (WEF on ASEAN 2017) held on 10th to 12th May 2017 in Phnom Penh, Cambodia. Also present at the Forum were Tan Sri Anthony Fernandes, Group Chief Executive of Air Asia, Tan Sri Jamaludin Ibrahim, Managing Director, President and Group Chief Executive Officer of Axiata Group and Dato’ Sri Nazir Razak, Chairman of CIMB Group Holdings. 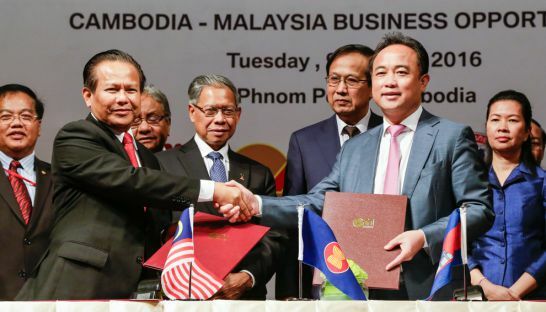 The Malaysia-Cambodia Business Seminar was held in Phnom Penh on 9 August 2016. The Business Seminar was organised to promote the capabilities of Malaysian companies, products and services. The Seminar was officiated by YB Dato’ Sri Mustapa Mohamed, Minister of International Trade and Industry and H.E. Pan Sorasak, Minister of Commerce of the Kingdom of Cambodia., H.E. Sok Chenda Sophea, Minister attached to the Prime Minister and Secretary General of Council of Development of Cambodia and Neak Okhna Dr. Kith Meng, President of Cambodia Chamber of Commerce also joined the Seminar.